Integrator: Avadis is an experienced AV integration company - from conception and installation. It specialises in meeting room projection integration, video walls for control centres or advertising, conference systems with the option for electronic voting and both cabled configuration or wireless. Distributor: EAVS Group import and deliver a full spectrum of AV products for installation and integration. It offers a range of services to include project consultation, technical advice and after sales support. “Our goal was to create a complete solution for the customer, which meant the integrated package dimensions were a critical reason for Optoma being selected”. “The Optoma LED display has enabled students, teachers and speakers to collaborate from wherever they wish to stand in the auditorium, making the new solution beneficial to every party involved”. Challenge: The Eurometropolitan e-Campus, located in Froyennes, Belgium, is a collective entity of higher education and continued training dedicated to the digital domains. 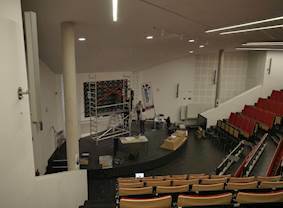 It needed a new large display for its 150-seat auditorium to replace an old 10,000 lumen projector. It was important to find a suitable solution that would match the impressive digital technology that the school represents. 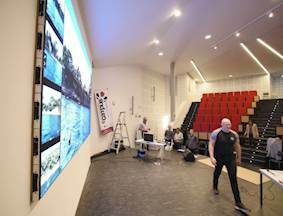 Solution: Avadis installed a 4 metre wide 2mm pixel pitch LED display to replace a 10,000 lumen projector and a 5.2m wide screen. 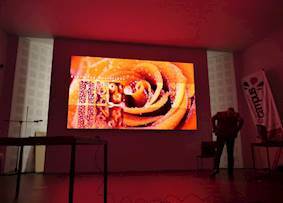 Assisted by Optoma ProDesign team, training, installation and calibration was completed in only two days. The new LED display had to be integrated into the existing set-up which included an audio system. It also needed to bring new features such as HDMI connection to the stage and a wireless, collaborative and interactive solution. The LS200T scaler/switcher is the perfect solution to manage all the video sources. The Eurometropolitan e-Campus, located in Froyennes, Belgium, is a collective entity of higher education and continued training dedicated to the digital domains. 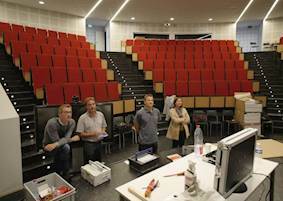 It needed a new powerful big screen display for its large 150-seat auditorium. 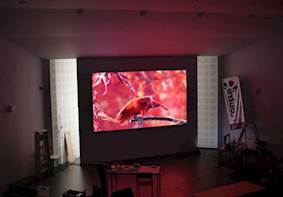 They needed to replace an old low contrast 10,000 lumen projector and 5.2m wide screen with a full solution that would become an essential tool for the university. As the university’s focus is towards digital, the display system needed to showcase cutting-edge technology at the e-campus. 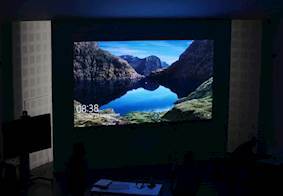 Avadis installed a 4 metre wide 2mm pixel pitch Optoma LED display (FHD20422) to replace a 10,000 lumen projector and a 5.2 wide screen. The Eurometropolitan e-Campus issued a tender to ensure they sourced the best solution for a new display. 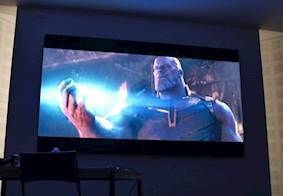 The decision to opt for an Optoma LED display was made due to the service quality that Optoma can offer, but also the ease of use for this type of LED display. 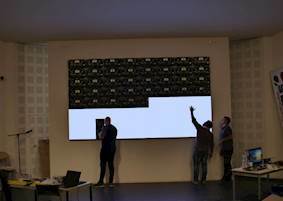 Assisted by Optoma ProDesign team, installation of the LED display was completed in just two days - one day for installation and one day for calibration. 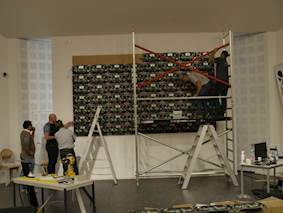 Short lead times were a key factor for the installation as the LED display had to be ready for the start of the academic year on the 12th October 2018. The new LED display had to be integrated into the existing set-up which included an audio system. It also needed to bring new features such as HDMI connection to the stage and a wireless, collaborative and interactive solution. The LS200T scaler/switcher is the perfect solution to manage all the video sources. Philippe Leclercq, Sales Manager at Avadis explained: “Our goal was to create a complete solution for the customer, which meant the integrated package dimensions were a critical reason for Optoma being selected”. The 4 metre wide 2mm pixel pitch Optoma LED display was also chosen due to its ultra-thin profile of just 56mm and the easy installation meant the solution could be moved to another location within the e-Campus if required. To top it all off, the LED display seamlessly connected to the already existing audio set-up and systems which made integration even more simple in the auditorium. 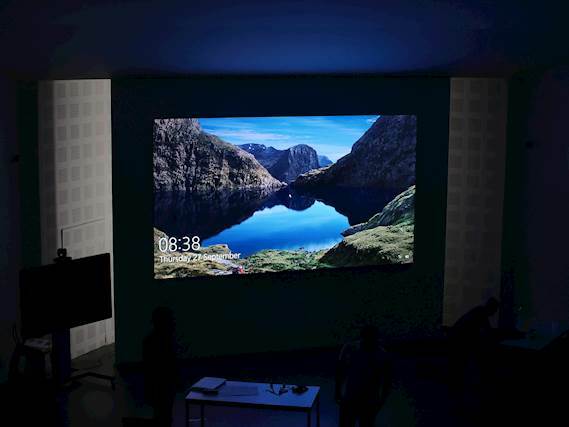 Lukalu commented: “The Optoma LED display has enabled students, teachers and speakers to collaborate from wherever they wish to stand in the auditorium, making the new solution beneficial to every party involved”.